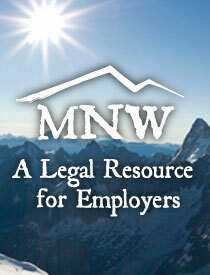 MNW Training Services - Employee and management training on employment-related topics both in-house and multi-employer throughout the Northwest. Workplace Investigations - Conduct investigations relating to violations of law and policy, suspected theft, misappropriation, harassment, discrimination. Hourly Representational Services - Drafting employment-related contracts, responding to external demands and complaints, Wage claims (DOL or Idaho State), EEOC, IHRC complaints, representation at federal and state agency levels. June 18-19, 2019 - 9 a.m. to 4 p.m.